Billy and KTM RC390 Win Australian “Battle of the LAMS Bikes” Title at Phillip Island Final. You are here: Home › Billy and KTM RC390 Win Australian “Battle of the LAMS Bikes” Title at Phillip Island Final. 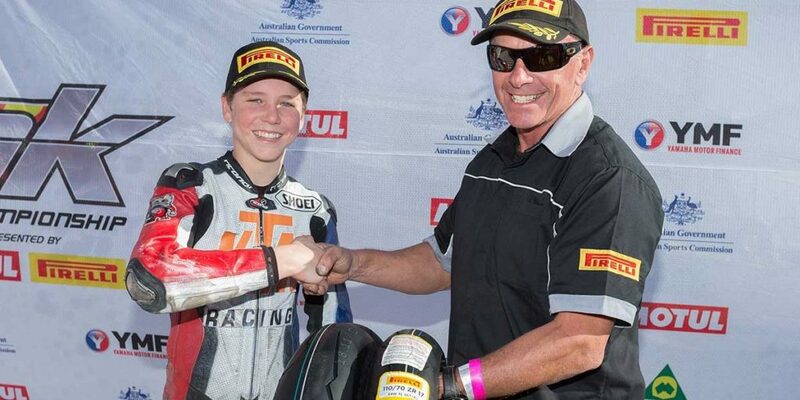 15 year-old Billy Van Eerde displayed a mature approach to the last three races of the Over 300cc Championship last weekend at Phillip Island. Billy went into the round ahead on points and then avoided the hotly contested battles up front between the Yamaha and Kawasaki riders in the first two races to just score enough overall points to stay in front. Then in the last race three Billy went out and won, beating his Yamaha R3 rivals Jack Mahaffy, Tom Bramich and Tommy Edwards and Kawasaki 300 Ninja’s Ollie Bayliss. The 2017 Supersport 300 Championship was a huge success for organisers with over 40 bikes maxing out the grid at every round, where monumental battles guaranteed thrilling action and attrition was the order of the day, in the LAMS bikes showdown. next post: Josh Waters and New Suzuki GSX-R1000R Crowned 2017 Superbike Champions at Phillip Island Finale.